As it is on the Circumvesuviana rail system it is easily reached from Naples and an ideal base for visiting Pompeii and Ercolano. Ferries regularly commute between Sorrento and Capri, making Sorrento an ideal base for exploring that island as well. By car:From Naples’ Tangenziale drive south towards Costiera Sorrentina, and be prepared to spend 1.5 hours in the traffic. Naples: Two companies are currently operating between the port “Napoli Beverello” and Sorrento: http://www.alilauro.it/ and http://www.snav.it (select “Capri e Sorrento”). The service is currently approximately every 120 minutes (July 2012). Price paid in port for a single trip, adult: 12,10€ (July 2012). It takes 35 minutes which is faster than by car or train. A trip to Sorrento is full of possibilities, enjoy a splash in the Naples Bay, a walk through the lively pedestrian only streets at night, or an enjoyable day exploring the ruins of Pompeii. A short trip to Naples will take you to the National Museum that houses some of the best frescoes and art work from Pompeii. You can catch a bus that takes you on a spectacular but hair raising drive through the Amalfi Coast. You will pass through villages built along the cliffs that have some of the most beautiful churches and architecture in the area. 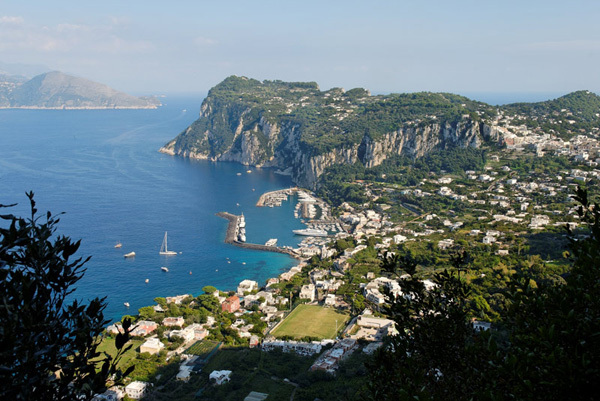 Take a ferry to the Isle of Capri where you can shop like you are on Rodeo Drive in Beverly Hills, or take the walk through tree lined walkways to the Nature Park. Capri also has the famed Blue Grotto, an amazing cave with the most crystal blue waters imaginable. But, one of the most fun things you can do here is rent a motor scooter and explore on your own historic Capri. Walk – if you’re not in a hurry you can stroll from one end of town to the other. Most of the town is reasonably level except for the steep descent/ascent to and from the harbour & beach. Local buses – the local bus service is good enough to visit all interesting places available in the area. You can also get a bus up & down to & from the beach/harbour area from town, if you want to avoid the short but steep walk. Lift – there is a lift to take you up and down between town (up on top of the cliff) and the beach and harbour area. The lift costs 1 euro and the bottom entry is located just to the west of the public beach, in amongst the private beaches. This is a few minutes walk to the west of the boat harbour (marina). In summer if you’ve had a nice cool swim and don’t want to get hot and sweaty walking up the hill this is a good option. Bike – See the bike rental section in the Activities section. Hire a private charter boat take a day trip to Capri and along the Sorrento Coast or to the emerging tourist destination island of Ischia. Charter La Dolce Vita are the industry leaders on the Sorrento, Amalfi and Neapolitan Coasts and can suggest beautiful itineraries to suit your time frame whether it be you are a cruise ship guest and only have limited time to experience the best coastal sightseeing or you are long-time Sorrento visitors and just want a lazy day at sea. Catch one of the frequent fast ferries to the nearby island of Capri for a day trip. When you get there you can make up your own itinerary including walking, a boat tour around the island, or hiring your own boat. Alternatively you can take an organised tour boat from Sorrento which rolls the trip to Capri and the sightseeing circumnavigation into one tour. Guide Sorrento (Sorrento Tour Guide), Sorrento, The original, licensed tour guides, organizing excursions in Sorrento and along the Amalfi Coast. Swim – Go to Marina Grande or (the better option) Marina Piccola (the main beach area immediately to the west of the ferry and boat harbour). At Marina Piccola, some reserved areas with sand will ask for a 8-11€ entrance fee (which will also get you a deck chair) and 5E for an umbrella. There is also a public beach at Marina Piccolo which has quite a small area of “sand” but ultimately you will be swimming in the same water as the private beach-goers. There is also a public sunbaking area consisting of a large wooden deck. Marina Grande, home of the fishing fleet, is a 10-15 minute walk west (via the city streets – no direct access via the coastline) and is quieter and has a larger public beach area with a few relaxed beach cafes and restaurants. A more spectacular option might even be Bagni Regina Giovanna, a nice little cove from the ocean in a secluded spot. Though a bit far, it’s worth the trip (ask the locals for direction). Another option is Meta which has a larger beach again but requires a ride on the circumvesuviana train. Bike rental Rent a bike and ride out of Sorrento to see the coast from above. There is only one bike rental (according to the woman in the tourist information, July 2012): Reaction Retail (http://www.sorrentobike.com/) in Viale Nizza 58, Sorrento. Price for 24h was 20€ (July 2012) for a decent MTB, a helmet and a lock. Gnocchi alla Sorrentina – potato gnocchi with tomato sauce and mozzarella baked to perfection.